The knowledgeable signage experts at Spotlight Signs and Imaging Solutions are your go-to experts when you need markers that put you in compliance with federal laws. Case in point is ADA (Americans with Disabilities Act) signage. Make a mistake here, and you may find yourself in violation of federal as well as local laws. If you operate a business venue that is open to the public, there is a good chance that you need to have at least some of these signs in place. Moreover, if you employ workers who help you with your business, there is also a mandate for signs in that setting. There is another group of professionals who needs to reconsider the addition of new signs: those whose current markers are only compliant with 2001 rules. We offer the best ADA sign consultation! An update to the ADA in 2010 spelled out a significant number of updates that would render your 2001-compliant signs as being no longer sufficient. If you make any changes to your business signs from 2001, you are obligated to bring all of your markers into compliance with the new signage requirements. Confused? Do not worry! Frequently, the upgrade is not as dramatic as it sounds. Character detailing. The characters on your ADA-compliant signs need to be displayed at a minimum height. Color choices. Colors must be contrasting. If two colors easily bend together and are difficult to differentiate for someone with a vision impairment, they are not in compliance. Grade II Braille. The dots associated with this tactile language must accompany some of the markers in your business. This is usually true for directional and emergency signs. Finishes. The ADA mandates the use of non-glare finishes for all signs that need to meet compliance standards. Mounting specs. There are predefined mounting heights for markers that target handicapped consumers and workers. These heights make the signs accessible for someone in a wheelchair as well as someone walking in your hallways. Mounting locations. 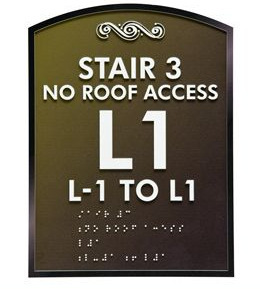 Stairwells and entryways are two mandated mounting locations for specific ADA signs. Do you know the other ones? Do not guess here since a mistake in this setting could result in a citation for non-compliance. We proudly serve the business communities throughout the Phoenix area as well as plenty of valley locations. 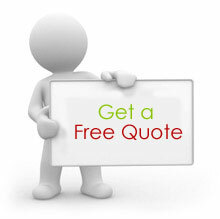 Our clients do business in and around Gilbert, Chandler, Mesa, and Tempe. When you talk to our ADA signage compliance experts today, we can quickly find out if you need to overhaul your existing signage or simply refurbish a few of them for renewed compliance. In some cases, you do not even need to make any changes!